Gallery of emotions and hexagram i-jing for facial make-up. Physiognomic symbols in this online gallery can be considered as template images or model patterns of emotions for cosmetic make-up. And also hexagrams of the canon of changes i-jing can be considered as logic set of constructive symbols for art designing of facial make-up. 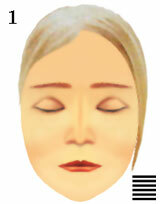 Facial features express absolute or uniform quiet emotions. Desires are unreal and the person does not feel oneself. Absence of feelings and ideas is a boundless silence which allows to be absent in world around. hexagrams i-jing in gallery and cosmetic make-up.